The A Brief History of Telecommunications infographic informs us that in 1876 Alexander Graham Bell made the first successful telephone call, speaking the famous words, “Mr. Watson come here, I want to see you” and 80 years later in 1956 the conference call was born. Some would argue that telecommunication has gone downhill from there. The dreaded conference call– It could be the ubiquitous business experience, affecting large and small businesses people alike. From the urban legend anecdotes of hearing bathroom noises, amorous moans, and wild parties to the all too real horrors of grating hold music, incessant static, and screaming children, is it any wonder that the very mention of a conference call evokes consternation and dread. I’m sure you recognized many of these, and have been guilty of several of them yourself. I certainly have. My most horrific conference call moment was several years ago, while taking the call from my home office. I had my feet curled up under me while on the phone, and I heard what I thought was a truck in the driveway. I hopped up to check it out, while still on the unmuted phone, and since my foot had fallen asleep it curled awkwardly and I fell flat on my face onto the floor. I suppressed a yelp, finished the call from the floor, and checked out the injury once it was done. I had sprained an ankle, torn a ligament, and ended up in a boot for 2 months. The best part—I checked with co-workers who were on the call, and found that they had no idea anything was wrong. While I’m not sure if that qualifies as good or bad conference call etiquette, it definitely highlights the dangers of multitasking while on a conference call. 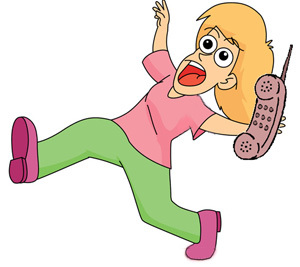 So, if conference calls have so many pitfalls (an in my case pratfalls) why are they still an everyday occurrence for most businesses? The short answer is that they save time and money. An old Verizon study found that in 1998 a five-person meeting conducted in-person (involving plane travel for four of the attendees) cost an average of $5,197.50, while the same meeting held as a conference call cost only $689.24. With the cost of travel increasing, and the cost of telecommunication services decreasing, that difference can only be larger today. Another current Verizon study found that conference calls are good for the environment if they replace travel. The study concluded that if 10% of airline travel were replaced by teleconferencing over the next 10 years, greenhouse emissions would be reduced by 199.8 million tons. To find out how much money your small business can save by replacing in-person meetings with conference calls, use the Verizon Conferencing Calculator. A recent Wall Street Journal post, Surviving a Conference Call: How to Stop the Rambling, Multitasking and Zoning Out provides additional examples of conference call horrors, including one instance of vacuuming while on the call and neglecting to mute, as well as highlighting some inherent problems with conference calls and how to overcome them to make the most of this time and cost saving tool. Mute ResponsiblyIf you must admonish your dog or your child, run the water, cough incessantly, or shuffle papers please do mute. Likewise if you are in your car, the airport, or some other noisy location. But if you’re sitting quietly and making ongoing useful comments leave the mute off to show that you are engaged. Stay On TopicWhy it is easier to let conversations wander into irrelevant territory when on the phone than it is while in a conference room is not clear, but this is one of the most common conference call issues. If you’re the call leader or moderator—keep everyone on topic. And even if you’re not, don’t hesitate to rein the group in when you notice it has wandered too far astray. Keep Everyone Engaged and IncludedThere is nothing worse than being on the phone in Kansas when everyone else in together in a conference room in Denver. You can often barely hear whispered side-comments, don’t know who exactly is in the room, and can rarely hear the joke over the room full of laughter. If you’re hosting a combo in-person/conference call make sure that everyone in your room and on the phone identifies themselves, discourage side whispering, avoid the temptation to mute your phone and have internal discussions while the remote people are speaking, and make sure to let everyone in on the jokes. Once you’ve mastered the audio conference call, you may want to take the next step into video conferencing. After all a picture is worth a thousand words, and it is often easier to read people when you can see their faces in addition to hearing their voices. Of course, it is hard to take a video conference in your bathrobe or while sitting in a crowded airport waiting area. But, it is something you’ll need to get used to, even as a small business owner. Gartner research predicts that by 2015, over 200 million global workers will be using video conferencing on their company computers. A recent Verizon whitepaper, There’s More to Video than Meets the Eye: Making the Cultural Shift to Visual Collaboration provides an overview of videoconferencing as well as help for making your employees comfortable with it. If you’re self-conscious about how you look during a video conference, check out the How Not To Look Ugly on a Web Cam infographic. If you’re not yet hosting your own small business conference calls, the ability to do so is definitely a tool you need in your box. Many telephone systems, even basic ones, come with the ability to host conference calls. But, even if you’re still doing business out of your car with a cell phone, there are a number of free options available. Skype Group calls are a good place to start if everyone on your call has a Skype account. For other good options, read this detailed review of four leading free conference call services.